Per the Space:1889 canon large quantities of metals, and thus cannon, are fairly rare on Mars. I have posited elsewhere that this is not due to lack of skills, but a shortage of resources and lower levels of atmospheric oxygen (which make smelting that much more difficult). It's not that the Martians are backward, it's just that they can use their limited supplies of metal more efficiently on other things. 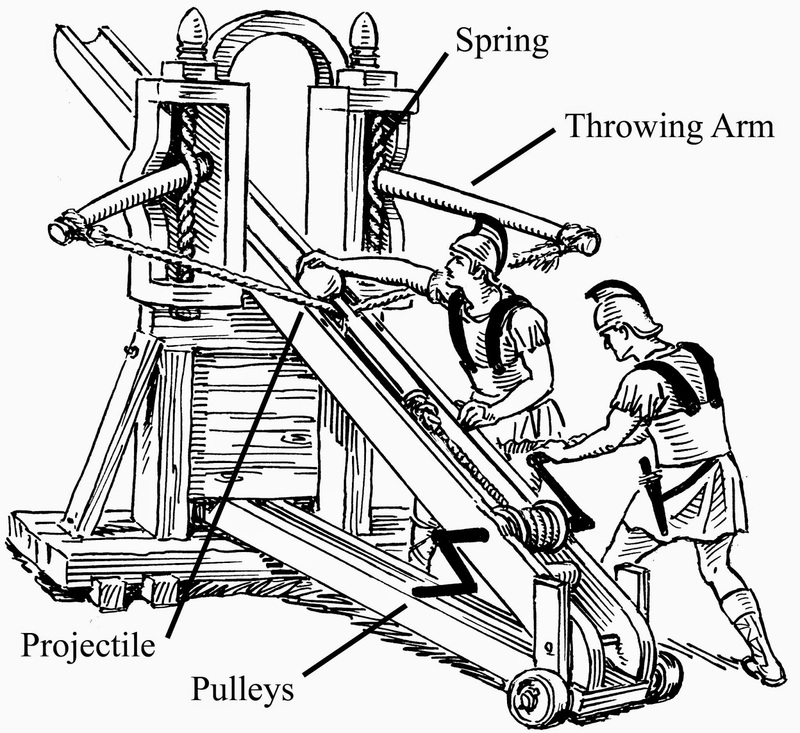 Here is an interesting site with a ¾ size working model of a Roman stone-throwing engine. It mentions that the model (a "medium" engine) can throw a 3-pound ball 200+ yards. Without intending to belittle their efforts in any way, if weekend reenactors can achieve this performance then I am quite sure that thousands (or even a few tens) of years of practical development would easily top that. Josephus mentions a Roman engine with a range of up to 400 yards in his Jewish Wars, for example. OK, but how would these fare on My Mars? Wood to make the frames isn't exactly abundant on Mars, but it's not scarce either. Metal could be used for the small parts where required (nuts/bolts, clamps, ratchets, ...). The skeins used for the torsion by greeks and romans were hemp, hair, leather or animal sinews, and I could see the tendons of gashants and ruumet brehrs easily being of the size and strength necessary. Alternatively my jee-oo is a material that naturally resists deformation, so perhaps if properly harvested and preserved it acts as the perfect skein for a torsion engine. So what might be the downsides of such machines? - Maintenance was apparently difficult in classical antiquity, with damp being the number one headache. That one's not much of an issue on Mars at least! Wear and tear on the arms and the skeins are also mentioned, but these are at least renewable resources, and I'm sure that Martian skill and ingenuity could get round some maintenance issues. It's still a weapon that requires some technical expertise, but so are cannon. - Range might be a problem, being outranged by cannon and not out-performing martian muskets by much, if at all. This reinforces the need for daa-nuu to be area effect weapons: there's no point one engine trying to outshoot ten musketeers if all it can fire is a 10lb rock, and that more slowly that a musket can reload. Missiles - what would daa-nuu fire? They can fire stones obviously. If you want some obstacles knocked over they'll do the job, but they aren't going to have much effect on anything solid like a city wall or an entrenchment. I'm pretty sure a 20lb rock travelling at speed would give even a ruumet brehr something to think about. How about an explosive shell? Space:1889 canon is silent on these as far as Martian technology goes, but perhaps that's the fault of extant Martian metallurgy, with shells being unable to survive the pressures of being fired from a cannon. But being fired from a daa-nuu is a very different prospect and should be a simple manufacturing job. They could even be a ceramic casing, with a simple burning fuse to light the breaching charge. Pack in a few sharp objects as well, if you want lots of shrapnel. That should keep musketeers' heads down! How about gas of some description? Or smoke shells? Perhaps flashbangs (or caltrop-filled) to disrupt gashant charges? The only limit is Martian ingenuity. I would see daa-nuu being deployed behind walls and in entrenchments, and masked from artillery fire until the enemy starts to close. Their main use is to break up enemy attacks. They might be wheeled for improved manoeuvrability, but they are tall and bulky by the nature of the drums/skeins, so I can't see them being horse artillery analogues. You might be able to mount them on a solid cart, but this just raises their profile and makes them an even easier target for artillery. That might still be a handy way to use them against the more backward hill martians, of course. Daa-nuu would work well on the back of a ruumet brehr as well, as there is far less recoil than with a cannon, and they are also MUCH quieter. In terms of modelling, there are plenty of companies that make them, with the Essex "30 mina bolt or stone thrower" (XEQ12) being a good size for my Black Hat figures. Unfortunately there's not a photo on their website, so you'll just have to believe me! Again, that's my shilling's worth. All comments and suggested improvements gratefully received. See my Hojaan-nuu I post discussing rocket-assisted munitions that would work well fired from a Daa-nuu. But bigger, of course! - the significantly reduced atmospheric moisture on Mars, which reduces the degradation of the torsion bundle and keeps the devices at full power longer. I totally agree that the Martians will have found ways to improve the performance of such machines. It's not because they are backward or can't make better that they use torsion engines, it's because they have gone back and improved something that does the job for a decent price. And I'm kicking myself that I missed the lower gravity (and also lower air resistance). That will certainly make a difference. More please! As it happens I have a brace of light ballistae looking to be re-purposed. I reckon it's a good low-tech solution to poor metallurgy on Mars, so fire away. When is a sepoy not an askari?